The story of a lifesaver for generations of babies. 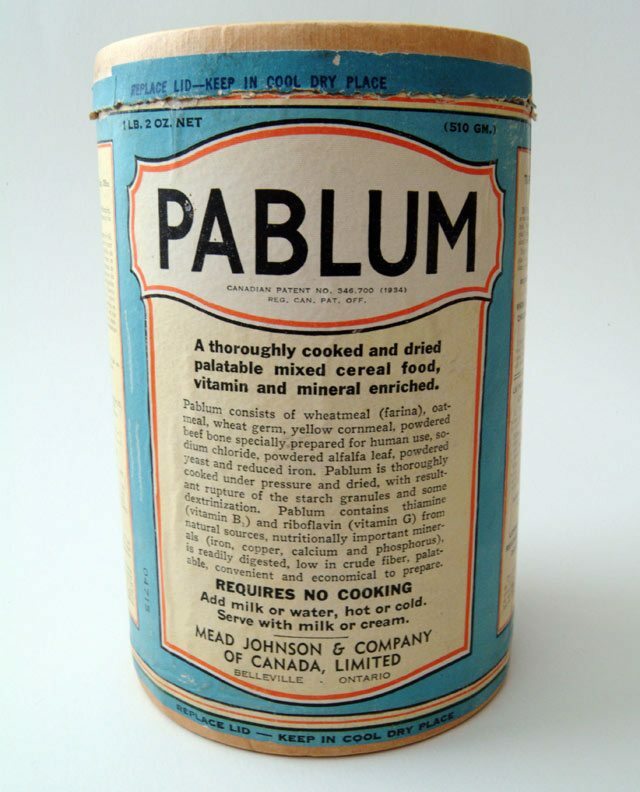 Early container of Pablum. Image courtesy of the Hospital for Sick Children. Making up for those deficiencies, as it turned out, reaped millions of dollars in royalties that allowed Frederick Tisdall, Theodore Drake, and their fellow pediatricians to carry on their research for decades to come. In the mornings they taught medical students and attended indoor and outdoor hospital patients. In the afternoons they repaired to the laboratories, changed their coats and did analyses which they themselves had requested as clinicians, performed any routine chemical examinations which had been requested by other clinicians and carried on with their research problems. One of the department’s key concerns was developing nutritious food for infants. Many mothers still made homemade formulas; however, these were little more than wet biscuits, and lacked the vitamins and minerals needed to keep children strong and free of diseases like rickets. Encouraged by the physician-in-chief, Dr. Alan Brown, Tisdall and Drake tested biscuits made from whole wheat flour, milk, bone meal, and iron. Animals, family members, and hospital patients were used as guinea pigs while a recipe was found that didn’t cause constipation or diarrhea. A dash of cream of tartar prevented the loss of vital nutrients like vitamins B1 and B2. On January 14, 1930, via a presentation that also credited Brown and Dr. Pearl Summerfeldt, Drake and Tisdall introduced to the Academy of Medicine “A New Whole Wheat Irradiated Biscuit, Containing Vitamins and Mineral Elements.” While their discovery wouldn’t eliminate the need to provide children with vitamins via a balanced diet and supplements like cod liver oil, the biscuit would “assist in the repair and growth of body cells and the maintenance of resistance against disease.” The presentation also announced that arrangements were made with a cookie maker to commercially produce the new food as McCormick’s Sunwheat Biscuit, with all patents held by the hospital and royalties directed to medical research. 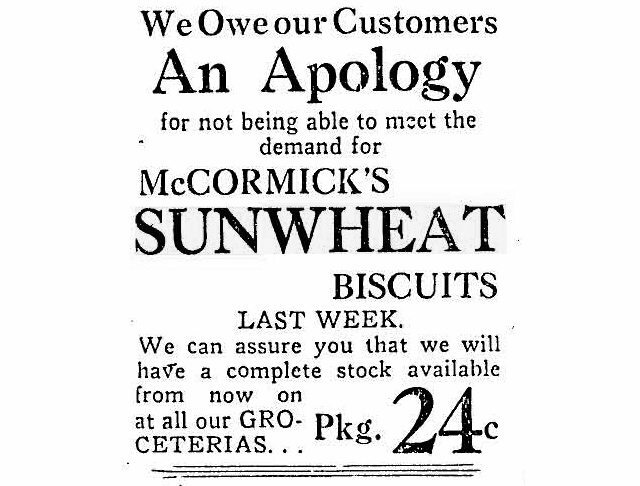 An indication of how popular McCormick's Sunwheat Biscuits were when they hit the market can be seen in this excerpt from a Loblaws ad that appeared in the February 6, 1930 edition of the Toronto Star. One problem: infants generally couldn’t eat biscuits. Tisdall and Drake worked on a separate formula that retained many of the ingredients used for Sunwheat Biscuits but could be spoon-fed to toddlers. For three months they tested their findings on family members (who complained the early results were “too bland”) and patients. The first formulations required lengthy cooking times, a potential turn-off for busy mothers. When the doctors noted a new process for dehydrating milk that used a heated rotating drum, they tried a similar approach to the formula. The result was a dry, flaky powder that contained all of the desired nutrients and kept indefinitely. Dubbed “Pablum” after pabulum, the Latin word for food, the hospital approached Chicago-based Mead Johnson Company to market the formula. As with Sunwheat Biscuits, Sick Kids received a royalty for every container sold for the next quarter century. In a case of understatement, writer Max Braithwaite later noted that “it turned out to be an excellent deal for many years.” Hospital officials found that the combination of the two new food products reduced the mortality rate of patients suffering from “nutritional deficiencies” during 1930 from 62 to 17 per cent. Dr. Brown’s role in the invention of Pablum has been disputed over years. Often listed with Tisdall and Drake as one of the product’s discoverers, it has been noted that his position as physician-in-chief entitled him to be credited with every book and paper originating from the institution. While some colleagues let this pass out of respect for Brown’s role in developing pediatric care in Canada, others seethed when they saw a man who they felt operated the hospital in a dictatorial manner attach his name to their work. It is likely Brown didn’t participate in the lab work but provided the support needed to carry it out. Left: portrait of Dr. Frederick Tisdall. Right: Dr. Theodore Drake in the library of the Hospital for Sick Children, 1949. Images courtesy of the Hospital for Sick Children. Tisdall and Drake continued their work on child nutrition, working with the National Dairy Council to enrich milk with Vitamin D during the mid-1930s. Both men earned the Order of the British Empire for providing nutrition advice to the RCAF and developing nourishing packages for the Red Cross to send overseas to prisoners of war during World War II. Tisdall died in April 1949, the day after the cornerstone was laid for the current Hospital for Sick Children building on University Avenue, while Drake passed away a decade later. Additional material from the 1930 annual report of the Hospital for Sick Children, Sick Kids: The Story of The Hospital for Sick Children in Toronto by Max Braithwaite (Toronto: McClelland and Stewart, 1974), Fifty Tales of Toronto by Donald Jones (Toronto: University of Toronto, 1992), Dr. Alan Brown: Portrait of a Tyrant by A.B. Kingsmill (Toronto: Fitzhenry & Whiteside, 1995), the October–November 2005 edition of The Beaver, the February 1930 edition of The Canadian Medical Association Journal, and the September 27, 1996 edition of the Globe and Mail. Special thanks to David Wencer for assistance with this article.